Sarah Wallman, widow, owned 51-59 High St as a farm at least from 1897 till her death in 1918. 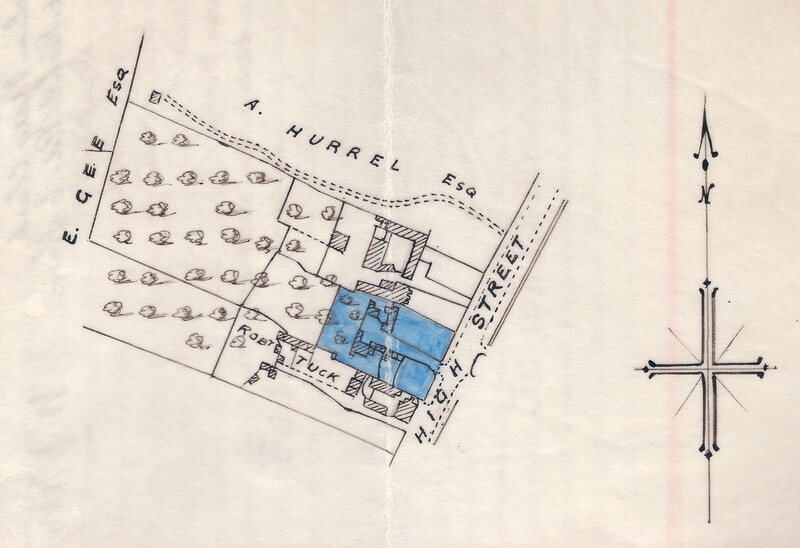 Then Nos 51 and 53 (shown in blue on 1918 conveyance document) were sold freehold for £400 to Francis Henry Lennard of Highfield City Rd, Gloucester, a Lieutenant in his Majesty’s Royal Garrison Artillery (later named as Gentleman in documents). Francis Lennard was a producer in the Harston Dramatic Society for a number of years. In 1918 Conveyance the Purchaser received: ‘all that piece of land situate fronting the High St at Harston in Cambs and being part of No 116 on OS map forming the site of two houses or cottages with gardens and orchards adjoining together with the two houses and buildings erected upon the said land and now in the occupation of Mrs Stoney and R J Sheldwick as tenants thereof which said premises hereinbefore described are more particularly delineated on the plan drawn in the fold of these presents being an extract from the said Ordnance Survey and therein coloured blue. 1947 conveyance map shows both No 51 and 52 were included in the sale. Mr Goode bought No 53 for £1500 and No 51 was sold, possibly to the Knight family at that time or later as it is thought Mr Knight bought this plot from the owner of No 57 High Street. Originally there had been a shed on the plot. 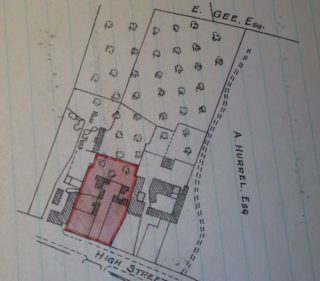 Mr George Knight ran a grocery business here, near the high St front of the plot, in a “prefab” building for a time (at same time working at Fisons- Mrs Knight being main shopkeeper), while he and his wife lived behind the shop in a caravan. He then built No 51 in about 1960/61- possibly around the grocers shop. George Knight’s shop started off as a grocers, then butchers, and finally ran as an antique shop/mending service. When the next owners, the Waltons, moved in they filled two lorry loads of wood-wormed antiques they had to dispose of. Around 1980 Dorothy and Bill Walton moved in with their 4 sons .They ran a business from the front shop area ‘in architectural ironmongery’ delivering to various ironmongers in the area. They did pre-packs, then Barri-packs – putting them on cards, of things such as doorknobs, hinges, handles, brass. Maureen Coads son (lived No 53) helped in holidays (1980s) packing up small plastic/celophane packets of nails/screws for the on-line business. A van would come & pick up the items to deliver. Bill’s white delivery van can be seen in the aerial picture c 1990s. 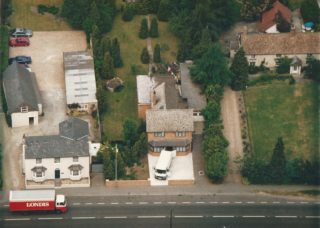 The older aerial picture c 1981 shows a narrow back extension to No 51. This was the kitchen which the Waltons widened (shown in 1990s aerial view) to accommodate their large family. 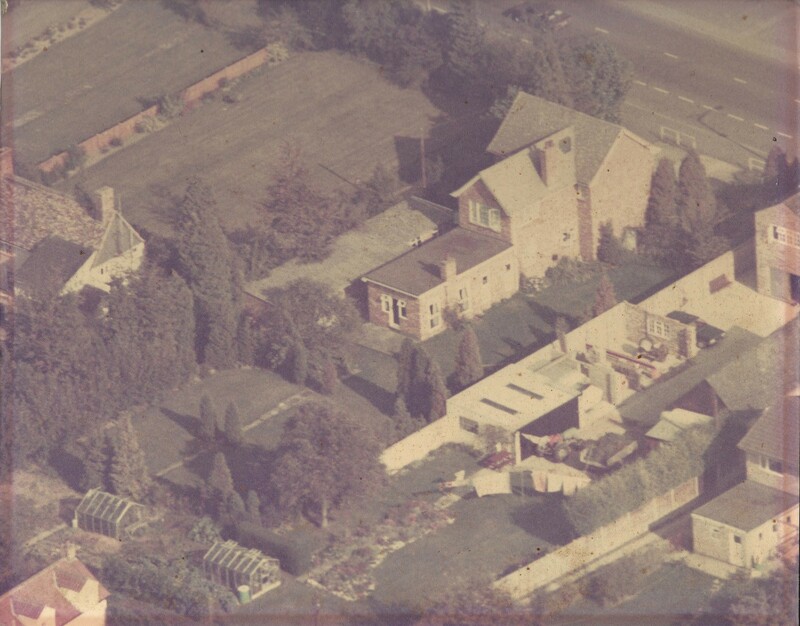 The 1981 aerial view also shows the original iron railings at the front which were later replaced with a brick wall to stop litter being blown or thrown in. Information provided by Coad and Walton family, and from various people’s memories. This page was added on 03/12/2017.